Another edition of a dining review that took place during DineLA week where we found ourselves in a predicament that had never seemed to happen before. We actually have to beg people to come to this restaurant. My man Gastronomnom was working hard on the twitter and Facebook outlets to see if we can find a person to fill in the last spot in our table. In a bit of surprise, for the last two weeks leading up to reservation date, no one has decided to take up on the offer. Was it because people in LA are not familiar with Kerry Simon or his restaurant? Surely people must have heard of him if they know who Ludo Lefebvre is. Kerry Simon is probably one the most unconventional of all fine dining chefs in LA. In many articles I have read, one of his most famous menu dish was the "Junk Food Platter" which consists of marshmallows, cotton candy, and other weird snacks that can substantially raise your calories count in one bite. Chef Simon started his distinguished career by taking a job in a restaurant kitchen because he needed to raise money to buy a guitar for his first true job passion.... a music career! Often labeled as the "Rock n' Roll Chef", he fell in love with the kitchen and decided to stick with it as a career changing move he never regretted. In his impressive resume, it included an apprenticeship in the Michelin Three Stars restaurant of Jean Morels' L'hostellerie Bressane had worked along side with an upcoming culinary superstar in the '80s (you guys probably heard of a guy named Jean-Georges Vongerichten). In an ascending career span, he was able to open up a restaurant in Las Vegas, aptly named "Simon". Very shortly after that, Chef Simon decided to migrate to Los Angeles and helped opened up "Simon LA" in the first floor of the very posh Sofitel Hotel. 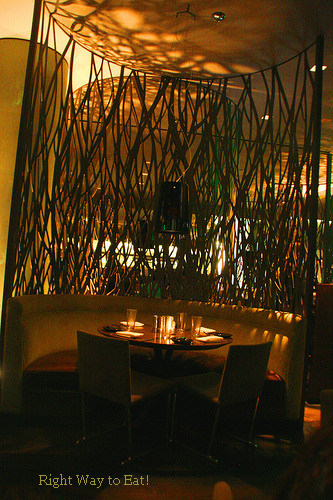 The dining room was elegant and was very dim lighted for a very soothing romantic atmosphere. I guess I was expecting a lounge type restaurant that seemed to be in vogue these days for many West Hollywood restaurants that get converted into dance clubs at night, but was pleasant surprised on how very mature the setting was without giving that hint of a conversion. For a New American fare, I was anticipating a steak fare for meat lover, some fish dish for seafood lover, and a vegetarian dish just round up the main course selections. I was figuring almost all of the DineLA selections played it safe to cover all three bases, but they would still need to impress to ensure for future repeat businesses from the frickle LA diners. All three selections of the DineLA starters choices are salads. I took the Jumbo Lump Crab salad is the only one selection at the time with proteins in the salad. 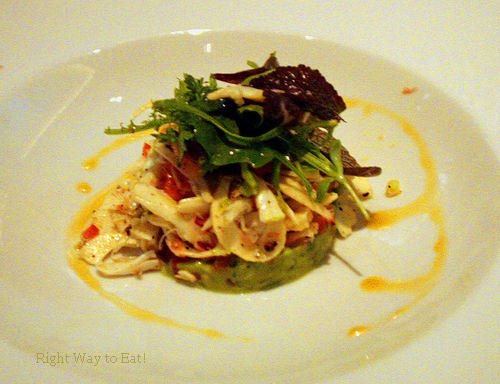 I really did enjoyed the salad with the avocado on the bottom of the salad providing a stark additives for the crab. It was a pleasing cleansers before the main dishes to come. I took the initiative of ordering a watermelon margarita. Somewhat sweet, but a solid drink that goes well with this interpretation of Chef Simon's crab salad. Cocktail drinks in the menu was worth exploring for future visits. Much to my amazement, the grilled skirt steak I have ordered is probably the best steak so far in my DineLA experience. The medium rare selection was cooked to perfection as it was able to retain the juiciness and flavor with the texture of the steak not dried out when it was served. Balsamic root vegetables added some nice compliment and worked very well with the steak. The steak was so good, it would be insulting to add A-1 steak sauce at this moment. It then got me thinking, if the steaks were cooked properly and seasoned correctly...would A-1 steak sauce be out of business? At this moment, who still uses that sauce anyways? One of the more bold and daring creations that Chef Simon has been marketed was for his desserts. I took a shot at the cheesecake only because it had the cotton candy. Yeah seriously, that was my only reason for ordering that dish. To my profound astonishment and going against rational that I had, I truly enjoyed the cheesecake. It looked like a half scoop of ice cream on top of the cookie, but it's really crust with a very rich cheesecake. Gastronomnom ordered the same dessert and was excited to find out it's cheesecake and not some random cream of cheese. 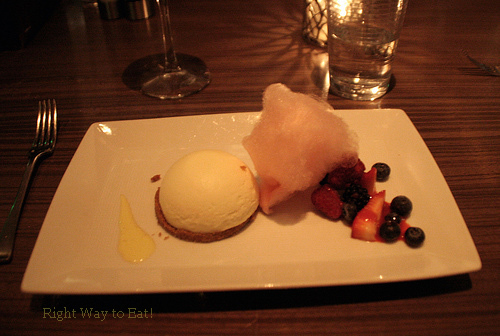 The cotton candy didn't do any harm to the dish or enrich the plate, which I think was only added for the show. Nothing more, nothing less. Underrated and in many ways still uncharted for many of the LA diners. I think if the place got passes the initial press of their bizarre desserts and let their main dishes stand out, they probably can attracted serious foodies and casual restaurant patrons to dine here more than just the special occasions. The glamorous setting is a huge plus and the great service we have for the night definitely make our dining experience that night much better. A return trip for other dishes in the future will be in the books. Definitely one of the most pleasant surprise in this go-around of the DineLA. Looks yummy! I would've gone! Most underrated. That's a big call! But I did enjoy it and glad we tried it for DineLA. Not sure I would have gone anytime soon if it wasn't for Resto Week, so that was a good incentive. Also honored to feature in 3 of your last 4 reviews! Great write up! I went to SimonLA years ago when I still lived up in LA, but was disappointed. I'm glad you enjoyed it! The junk food platter certainly was creative. Man that does look pretty good, I should've gone. Best steak during dineLA eh? I kept meaning to try this place but the mixed reviews kept putting me off I guess. I hope you do get to visit this place one of these days. It's really a treat to go. Underrated in sense of no one expecting it to be good. I think the news of them sort of rub off from its early days of that junkfood platter. I'm sort of curious in other dishes. LA is a big place and I'm sure we have other places to try out. We have dine 5 places together in the last two months. Of course, you are part of my foodie adventure! I probably don't blamed you on the past dining experience there. I think it was sort of brash of them to use the junkfood platter to attract club going crowds and other lounge lizards. Yeah, I'm just glad it worked out for me in this time around. 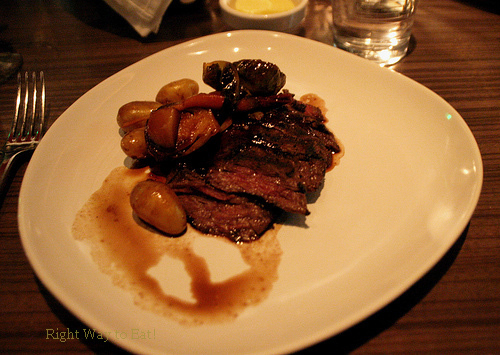 Yeah, the steak was cooked beautifully here than at Spago (where I promptly paid $60). The mixed reviews are harsh, but I don't think too many people did a review in the blogsphere about this place. Not recently at least. 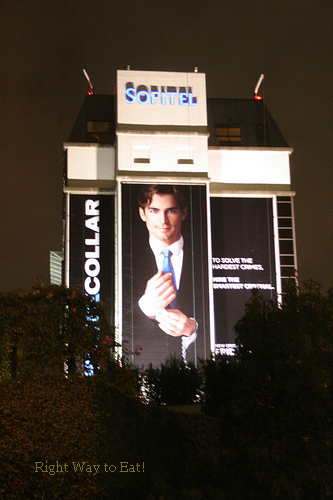 So it was a good time to check it out during DineLA. Yeah, you should have gone. LOL Next time! Those photos are so impressive. I am so in love in those foods. I hope someday I can have a chance to visit that place. I really need to try all those delicious foods.